We’ve all been amazed by the trans-Pacific journeys of godwits, Alaskan breeders that make their way to our shores. For my mind, the migration journey’s prize must go to this bird – the white-faced storm petrel – my contender for Bird of the Year. Come February through to March, these diminutive seabirds (45g) will depart our waters and then hop, skip, flutter and glide their way across to the eastern Pacific (off Ecuador) to feed in the rich waters of the Humboldt Current before making the return journey in August-September. I’ve seen them in French Polynesian waters (near Pitcairn) en route back to NZ. I’ve also seen them feeding with other storm petrels near the Kermadec Islands (on one occasion in a huge mixed flock). These birds breed on scattered islands around northern New Zealand, the Chathams and Stewart Island. In their colonies at night (they’re nocturnal over islands) they appear like hundreds of dainty moths when caught in the light of headlamps or spotlights. In my mind one of the most beautiful wildlife sights here in NZ. You can hear them too, either in flight or from the ground. The recording here is a male calling from the entrance to its burrow advertising for a mate (I was sitting close to it hidden by a dense mound of Muehlenbeckia). Halfway through the recording another bird lands and a duet ensues. Play the recording – white-faced storm petrel. We see them in the Hauraki Gulf during their breeding season – from late August to March. 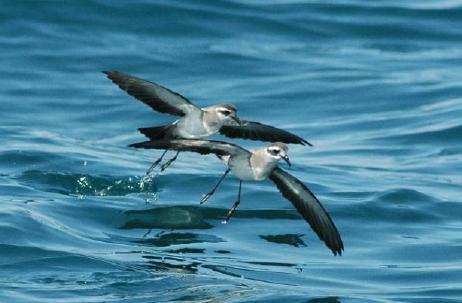 Often referred to as “Jesus birds” because of the way they use their feet on the sea’s surface; dabbling surface-feeding behaviour and their pogo-hopping method of propulsion with wings outstretched (pictured). Needless to say vote for the White-faced Storm Petrel!! I see that NZ storm petrel is also on the list of nominees. Is this a completely separate species? They both spend time in the Hauraki Gulf where they breed – this makes them a NZ “native” I’m guessing? The white-faced storm petrel and NZ storm petrel are different species; very different birds. Two days ago I was watching both species together; quite different physically and in behaviour. Both occur in the Hauraki Gulf from September to April/May, although only the white-faced storm petrel has been confirmed to breed there. No one knows where the NZ storm petrel breeds – yet. There are several other storm petrels breeding in the NZ region – Kermadec storm petrel, white-bellied storm petrel, grey-backed storm petrel and black-bellied storm petrel. Wilson’s storm petrels, which breed on Antarctic islands, visit NZ waters on migration through to tropical waters post-breeding.